The ancient sacred Kemetic wisdom texts declare, "Better is a book than a well-built house, than a tomb in the West. Indeed a book is better than a great house with a solid foundation or a stela in the temple" (Karenga, 1984, p. 84). Today, we, and our children, are subject to gangsterized and criminalized images of African people in America in the attempt to justify our extermination. Sophisticated mass media manipulation places these images in broad circulation. Miseducation in many public schools aids this process with textbooks that are woefully insufficient and teachers who lack cultural competence. This book marks the beginning of a highly anticipated series to increase our cultural competence by one of our great Master Teachers. Professor Kaba Kamene is a trusted Elder, a Seba (Master Teacher) who opens the door to the Universe so that his students may shine like a star" (Obenga). His work as an African-centered educator with over 30 years of public school teaching experience, scholar and professor of Black Studies, represents the continuation of a powerful priestly Kemetic cultural tradition that is essentially African. Professor Kamene has a track record of producing excellence in some of the most challenging urban schools and the rare distinction of demonstrating this excellence in working with students from Pre-K to post-doctorate. He is a living library who has apprenticed under sacred African Master Teachers like Dr. John Henrik Clarke and Dr. Asa Hilliard. The Maafa is the catastrophic interruption of African sovereignty and civilization. It includes far more than "slavery" and lynching and it is still going on. To emerge in the midst of our captivity with any semblance of African consciousness is nothing short of a miracle, given the fact that the best minds of Europe and America have been put to the task of ensuring that our culture and consciousness be obliterated. 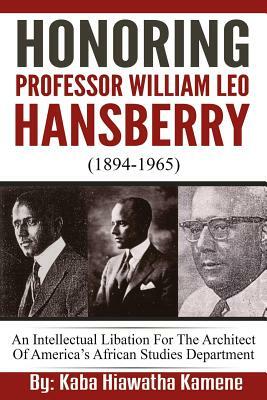 This book is a literary libation that elevates and celebrates the life and legacy of William Leo Hansberry, the Father of Black Studies. He had the character, consciousness and commitment to "rescue and reconstruct our history and put it back into the hands of those who created it" (Karenga, 1984). Professor Hansberry, along with Professor Kaba Kamene, constitute a small cadre of keepers of the culture who have labored in the face of continuous high-tech attempts to erase our culture. This book is a gift and a treasure. Like the ones that will follow it in this series it is a critical piece in the puzzle for our cultural reconstruction and identity restoration. As my grandmother used to instruct me and my siblings growing up, "read and be wise." Chike Akua, Teacher Transformation Institute Author of Education for Transformation: The Keys to Releasing the Genius of African American Students Please confirm that you have received this and that is sufficient. Shemhotep, Chike Akua.